On Nov. 15, JJC’s own Wolf Pack Video Productions Club collaborated with local film company Road 2 Eternity and the digital media production program to host “Face to Face with the Media Industry,” an event with appearances by several filmmakers and actors. 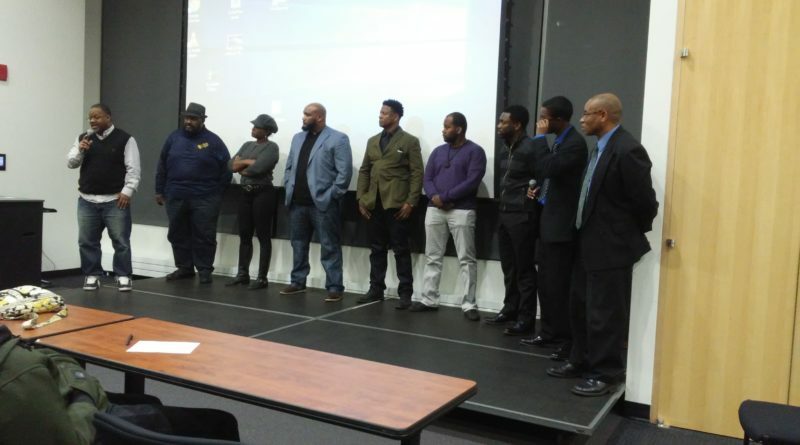 Guest speakers included the Road 2 Eternity president Michael White, actors Kai A. Ealy, Harold Dennis and Lawrence E. Johnson Jr., filmmaker and founder of El-Amin Studios Shad El-Amin, director and producer Gerald Hall, JKBU Productions’ own Cortez Mack, broadcasting engineer T.C. Hill, and cable talk show host Audrey Kenner. Also making a brief appearance was Chicago filmmaker Will Adams, who has written and directed several short films, including “A 3rd First,” which was shown during the event and featured Johnson Jr. as the male lead. “[They’ll] explore instead of focus… [and] be able to have fortitude and be dogmatic,” she states about the opportunities the event offers. First to speak was Wolf Pack adviser Sandra “Shelly” LaFevers, who expressed her excitement about the turnout of the event, which at first glance held at least 20 to 30 people. The speakers at “Face to Face with the Media Industry” would go on to say the same thing in their own public speeches, including Ealy. Ealy, who has acted in various films and shows such as “Chicago Fire” and “Fallen” and traveled from Atlanta to Chicago at the beginning of his career, emphasized that the “starving artist” myth is real yet now has contributed much to the media industry. “It isn’t impossible to do this work in Chicago,” says Dennis. Having spent time in Chicago’s ETA Creative Arts Foundation, an acting troupe, and performed about 171 shows on stage, he has had about 20 years of experience in the business and facilitated acting workshops. Both actors presented their own film reel during the session, which included shows and movies they were featured in and served as beneficial examples to film students. Also speaking was El-Amin, who created his own film studio and the film “Girl Assassin.” The process was not an easy one, though. Struggling for years in school and being placed in special-ed classes, he was able to find his voice in film. He founded his media company B.A. Blessing Productions in 1993 and has written and produced 34 stage productions. Following was Mack, who is also a director, producer, and writer. His first film, “What About the Children?” focused on neglected children and was repeatedly rejected by film festivals. It was not until he received a letter of recognition from the President of the Academy of Motion Pictures Arts and Sciences that the film opened doors for him. He has gone on to make two more short films: “Bobby” which depicts mental illness in the black community and “Dinner Table” which touches on the negative effect of technology on families. “I do films that deal with reality–or I try my best [to do so],” Mack says. Next to speak was Hill, who explained the technical side of filmmaking. He has worked for several major television channels, including CBS and Fox, and now works at PBS. His job also involves training photographers and editors, the latter of which he stresses need to know every single editing program, including Final Cut, Adobe Premiere, and Avid. Kenner spoke very avidly about passion, saying that following and achieving her dreams–in only five years, no less–was happenstance. Finally, the filmmakers gathered onstage for a Q&A where the audience could ask questions about the industry. Several asked about developing and accepting scripts, communication between filmmakers and actors, challenges, intimidation, and being a rookie in the industry, and the writing process.